When it comes to dental emergencies, one can never be too careful. So, the very first step to avert permanent damage from sudden dental injuries, toothaches or chipped teeth, is to have contact information of dentists and dental clinics handy. Moreover, children and the elderly may also injure themselves suddenly and may require immediate medical attention. 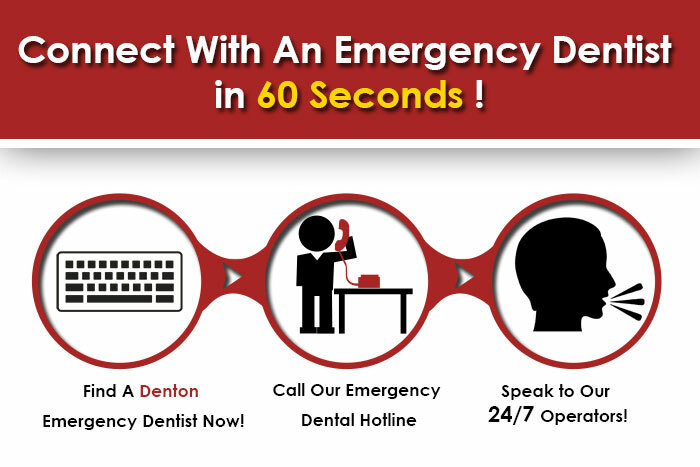 Hence, emergency dentists are essential, as that they stay open twenty four hours a day to cater to your emergencies. When an emergency occurs, waiting till the next morning is never a feasible solution, as these issues need immediate attention to prevent further suffering. Office goers who are only free on weekends might need an appointment during those days, hence, the need for emergency dental clinics. And so, the wisest precaution in this case would be to keep some numbers written down in case of emergency. Denton happens to be the 27th most populous city in the state of Texas and the 11th largest city in the Dallas-Fort WorthMetroplex. Thus, the residents know the value of emergency dentists, being a city of around 113,383people. In a city as populated as such, there has to be someone to look after the emergency dental issues of the population. If you happen to live in Denton, it is best for you to keep some contact numbers of your local emergency dentists handy if the unthinkable happens. The following is a list of some dental clinics that might come in handy during emergencies. Lillian Miller Dental is a great place for people who need special care, such as children. Services like General, Cosmetic, Restorative, and Sedation Dentistry are offered. The doctors specialize in dental implants, gum disease treatment and prevention, tooth whitening, and root canal therapy. They are conveniently located at 2430 S Interstate 35E #210. Call for an appointment at 940-387-2214. Being located at5017 Teasley Ln Ste. 165, Hickory Creek Dental takes pride in its caring medical team consisting of Dr. Barnum, Dr. West, and Dr. Svetlana Perry among others. It offers specialized care services, such as Tooth Veneers, Tooth Whitening, Tooth Extraction, Dental Implants, and Sedation Dentistry, etc. Call them today at 940-387-4597. Anew Dental welcomes all insurance plans, including MetLife, Delta, Aetna, etc. It also accepts Medicaid and CHIP. Dr. Trinh Pham and his friendly team of dentists have years of experience treating a wide variety of dental needs, such as pediatric dentistry, cosmetic teeth whitening, braces, root canal, and tooth extraction. They are located at1601 Brinker Rd #111.Call them today for more information, to book an appointment or during emergencies at 940-565-5049. As sweet as the name sounds, Vanilla Family Dentistry boasts a friendly staff and welcoming environment. Services includeInvisalign, Lumineers, children’s dentistry, extractions, fillings, etc. The location is 3969 Teasley Lane, Suite 1500,and you can call at 940-387-2273 to book an appointment.